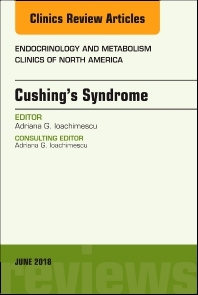 This issue of Endocrinology and Metabolism Clinics, edited by Adriana G. Ioachimescu, will focus on Cushing’s Syndrome. Topics include--but are not limited to--1. Diagnosis of Cushing’s syndrome in the modern era, Gene mutations in patients with Cushing’s syndrome, Morbidity in Cushing’s syndrome and impact of treatment, Localization of ACTH-dependent Cushing’s syndrome, Prognostic factors of long-term remission after surgical treatment of Cushing’s disease, Outcomes of pituitary radiation for Cushing’s disease, New molecular targets in Cushing’s disease, Recent advances in subclinical Cushing’s syndrome, Adrenal surgery for Cushing’s syndrome, Adrenocortical carcinoma with hypercortisolism, Ectopic Cushing’s syndrome, Medical therapy for Cushing’s syndrome in the 21st century, Pregnancy in patients with Cushing’s syndrome, Mortality in patients with Cushing’s syndrome, and Cushing’s syndrome in children and adolescents.